Hey everyone! I just ran the random.org list generator and it selected CAM HARTMAN as the winner of the Classics vs Currents participation drawing. His good luck has brought him a computer version of the Strat-O-Matic baseball game! CONGRATULATIONS! Again, thanks to everyone that played in this year's tournament! I am hoping to run another one of these next year, and in the meantime, I will be holding an off-season tournament later this year. Hopefully, I'll have a better grasp on the game and will be able to let the managers choose their own line-ups etc! 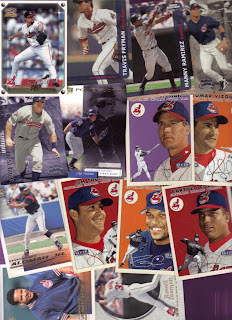 Stay tuned to Tribecards for more Indians card related posts. Time to get back on track. Kinda like the Tribe themselves. Kevin Bearse rookie Bowman card. 1990 was the only season in which he played. He pitched in 3 games (7.3 IP) and garnered a whopping 12.91 ERA. Hey, for $100,000, I'd happily pitch seven innings for the Tribe! Then, we have Herb Perry's UD Prospect card. He played three seasons with the Tribe. His 2nd season was his best with a .315 AVG. And then there was V-Mart. He played 8 seasons with the Indians, and I hated to see him get booted during the fire sale that is the Indians management strategy. Up next, Thomas Howard on Topps Gold. 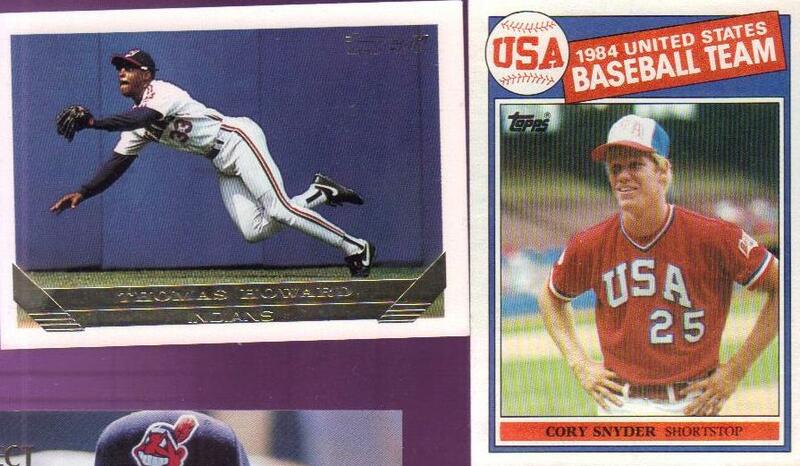 Howard played most of '92 and part of '93 with the Indians. He averaged close to .250 with 55 RBIs. In 1993, he was traded for Randy Milligan. Yeah, I don't remember Milligan either. 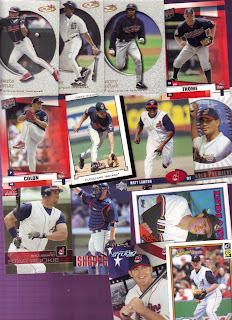 Cory Snyder, however, is one of the All-Time Tribe fan favorites. 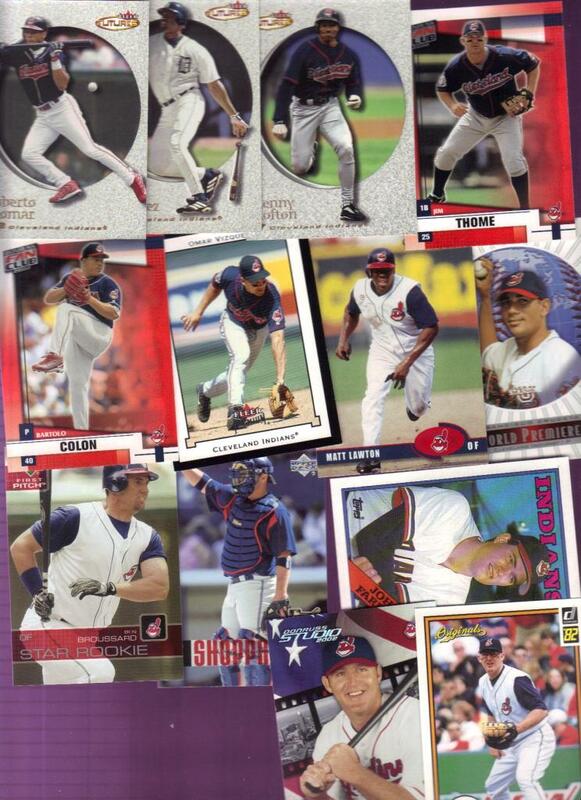 He played with the Tribe for nearly five seasons. Albert Belle finishes up the gift from Bo! 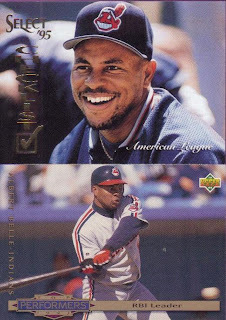 Belle (Joey to his friends) played eight seasons for the Tribe. Much like my appreciation of Michael Jackson, I appreciate Belle's baseball career aside from his personal shenanigans. Gint-A-Cuffs II is almost here! I have NO idea what that means. I do have an idea, though. I think it means a chance to win free cards by earning points. How do you earn points? I have no idea. Once you earn points, how do you tell someone? I have no idea. Will I be participating this year? I am hoping so. Then, of course, there are the other questions that run through one's mind... "Namely, how do I find the Count? Once I do, how do I find you again? Once I find you again, how do I escape?" Want more info about the contest? Check it out HERE! The winner of the 2010 Tribe-O-Matic Classics vs Currents tournament, KevinM, chose the computer game as his prize! ThaneR was glad to receive the board game, saying "that's probably what he would have chosen if he had won, so it worked out!" Once again, CONGRATULATIONS to KevinM and his 2009 St. Louis team! And a HUGE thank you to everyone that played and came along to watch! The drawing for the other computer version will happen later this week. When I announced the opening of the Classics vs Currents tournament, I also shared that Eli over at OneMorePack had sent a slew of cards to me. 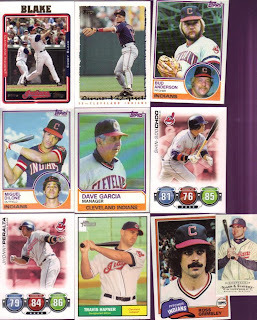 Before we get to the Tribe-O-Matic Championship Game, I thought I'd take a moment to share with you the cards he sent to me! 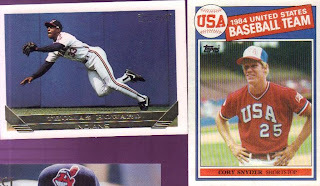 The stack of cards started off with a 1986 Sportflics Jersey/Logo Duflex mini card! Awesomeness! As you can see, there are also some other cool cards in there. 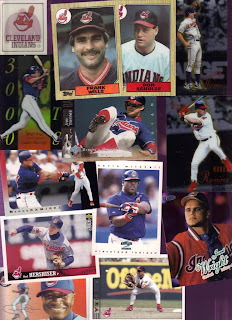 Several Thome's are spread throughout, plus a very cool Eddie Murray card! 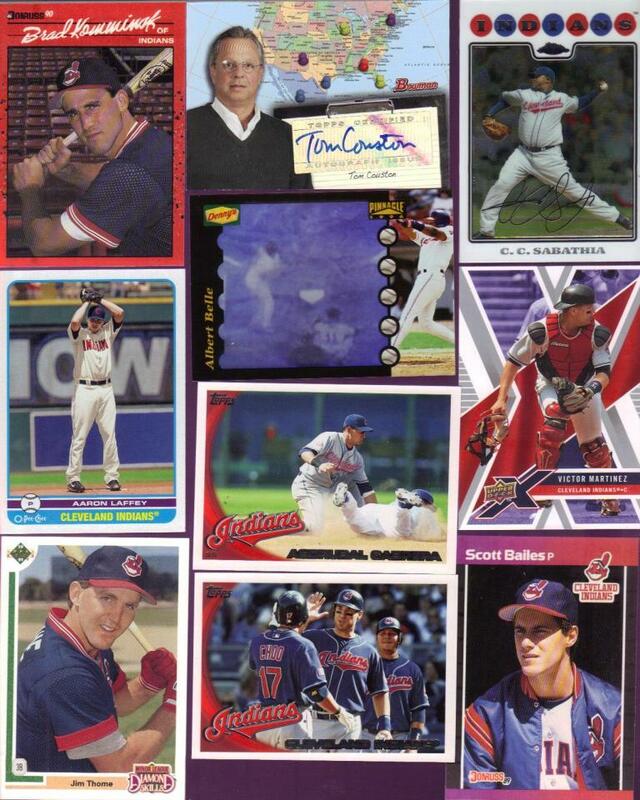 More Thome, some Manny, and a slew of other Tribers keep things moving right along in the Tribecards department! What a great mix of players and cards here! And, the great cards continue! 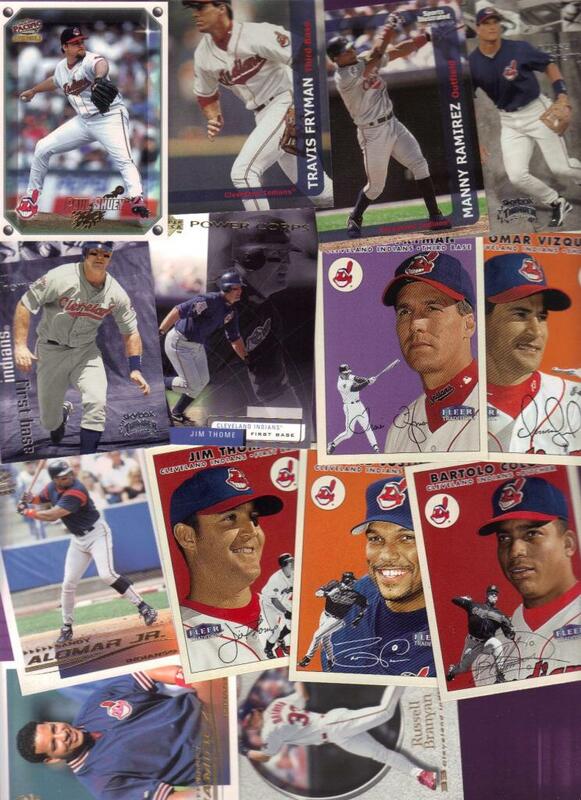 MORE Thome and several cards I don't recall seeing are spread all over the stack of wonderful cards Eli sent to me! It will be a while before I can return the favor, as I am still way too low on my non-collection cards and I've not been able to score a great deal on bulk cards lately. But, that'll change and then I'll be able to send some his way! THANK YOU, Eli!! 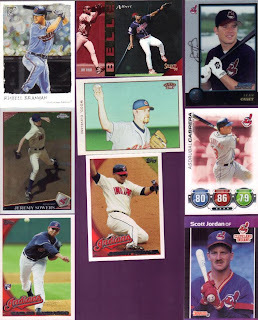 These will be a lot of fun entering into the Tribecards CardCollector Database! Good evening, folks! What a great day for baseball! The weather service says things might get dicey for us, but that we should be able to finish the game before the storms roll into town. Let's hope so! 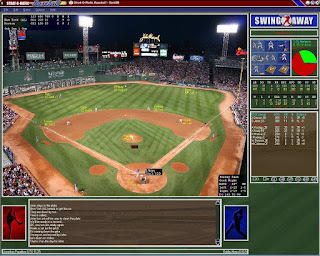 If you remember, yesterday's game saw KevinM's 2009 St. Louis team put some serious wood to AndrewH's 1909 Chicago NL team! The boys in red move into the championship game with a victory score of 7-2. The question on everyone's mind tonight: Who will join KevinM for the Tribe-O-Matic giveaway championship game? And then, the next question: which version of Strat-O-Matic will the tournament winner choose - the board game or the computer version? Remember, you can scroll to the bottom of this post for the final score and other stats. I hope your ready for some baseball! And now the Ump says "PLAYBALL!" He must be getting tired from diving back in! Time is called by the umpire! He's been called for a balk! The fans want the "K"
Los Angeles(AL) tries the hit and run! What a bunt by Isbell! And he tracks it down nicely! Atz is on his way! On the money and Atz is out! Dougherty is out at home! Cole comes through in the clutch! He just avoids the tag! He's digging out his "spot"
Maicer Izturis steps out of the dugout! In 2006, name the first pitcher to win 15 or more games in 19 consecutive seasons? Before we get to tonight's trivia answer, don't forget to stop by the souvenir stands throughout the park. You'll want to grab a few things for the kids before heading home after the game. For your convenience, the souvenir shops are open for an hour after each game. There he goes for second! Beautiful play by Dave Altizer! Dougherty is off on the pitch! And he makes the catch for the out! Now that one had a nice wrinkle to it! *Note: I added the souvenir commercial and changed the attendance number. It had been reported at 1,250. While that might be historically accurate, I found it a tad low. The Tribe-O-Matic Championship game will be played Sunday afternoon between 2009 St. Louis (KevinM) and 1909 Chicago AL (ThaneR)! It all comes down to a true Classics vs Currents game right to the bitter end! Who do *you* think is going to take it? Will the team of days gone by pull out the win, showing that the boys of summer from yesteryear are better than current players, or will today's players be able to slug it out and show the old-timers just how much the game has changed. Of course, the fact that everything comes down to a team from 1909 and another from 2009 shows you that the game truly is America's pasttime - timeless through the ages. 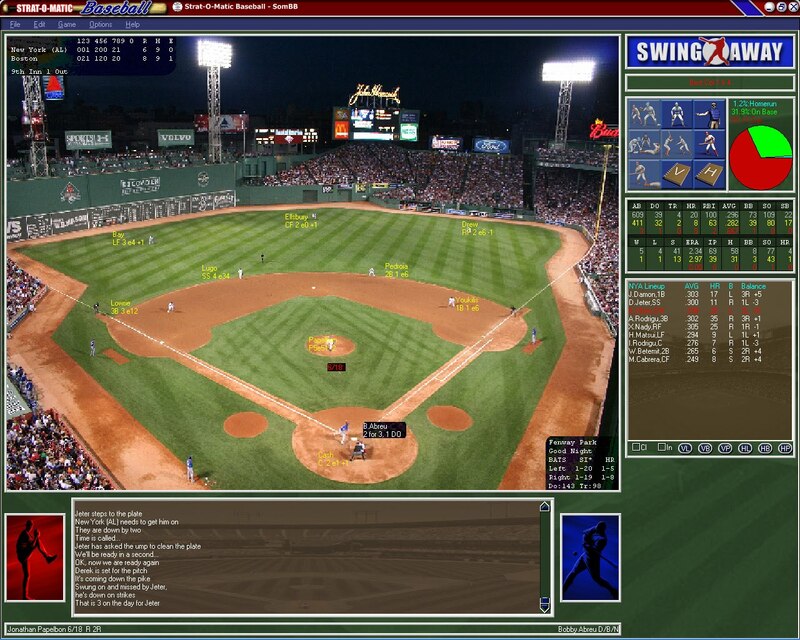 Box scores, Player Activity, and Scorecards from tobight's game are here. The battle for the championship spots begins tonight! The first game to decide who moves on to the Tribe-O-Matic giveaway tournament championship game played out just moments ago (that is, around 5:30pm CST on Friday night). Tonight's match-up features the 1909 Chicago NL team versus the 2009 team from St. Louis! Can the boys in blue pull one out and find their way to the final game? Will the rogues in red take the win and head into Sunday's final game? It's a patriotic semi-final match! 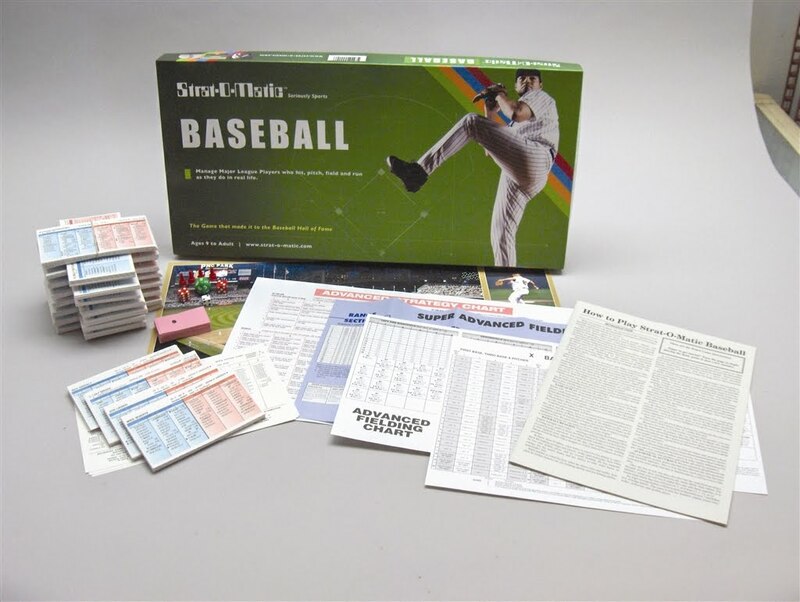 Before we get to the game, this is a reminder that tonight's game, and the entire tournament, is sponsored by Strat-O-Matic Baseball: Seriously Sports! Visit Strat-O-Matic at http://www.strat-o-matic.com/ the next time you're online and check out their wide array of dice-based board and computer games! Fun for the whole sports-loving family! Remember to tune in tomorrow for the semi-final match-up between 1909 Chicago AL and the 2009 Los Angeles (AL) teams! We shall see if he was right! Yadier trots down to first with a big grin on his face! And brings it down in the webbing! That is one long home run! IT'S WAY BACK THERE . . . He snares it for the out! He is jumping up and down as if on a pogo stick! Lou Brock, Maury Wills, George Case and George Sisler? 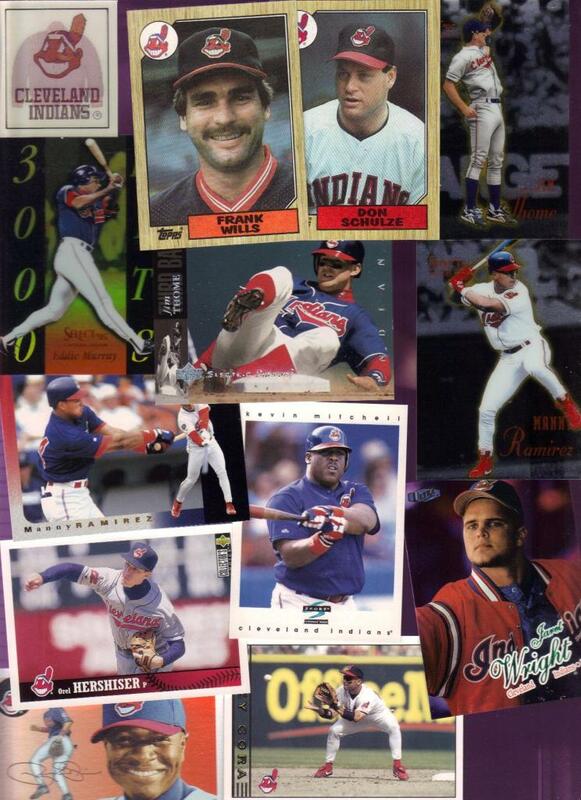 Tonight's trivia game is sponsored by Tribecards. When you're looking for your favorite Indians players, or just some random jibberish generally surrounding the game of baseball and the card-collecting hobby, think Tribecards! It's through for a base hit! Holliday now has 2 homers on the day! Matt Holliday gave it a ride! He is 2 for 4 on the afternoon with 2 home runs! Harry dives, and makes the play! Right into his outstretched glove! Schulte swings and misses, strike three! He was 2 for 4 with 2 homeruns! There you have it, folks! KEVIN is the first manager advancing to the Championship Game, which will be played on Sunday afternoon (CST)!! Congratulations to Kevin and his 2009 St. Louis team! Let's see how he does, and let's see how our two teams fare tomorrow! Box Scores, Play Account and Scorecard are here. *Note: I added the "Tribecards commercial" and I combined some sentences to help make the overall length a little shorter. No actual game text was altered, however. So, yes, he really said they needed a touchdown... oy.